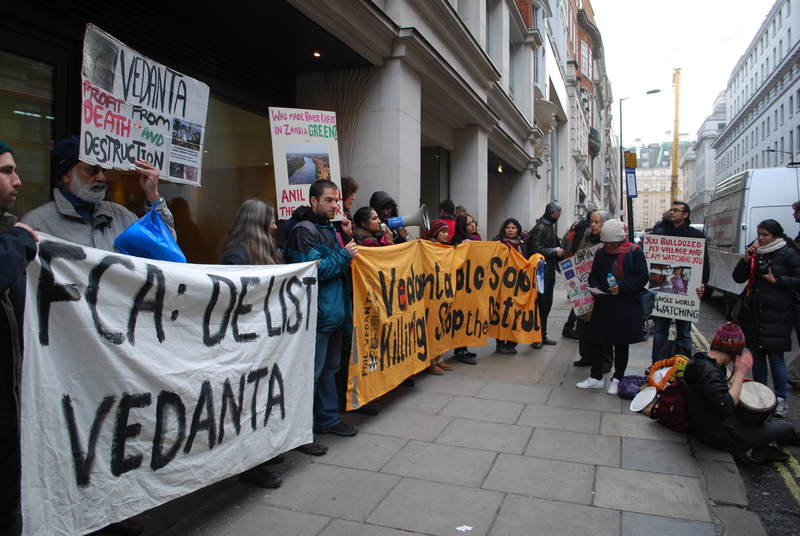 Vedanta headquarters were blocked by protesters demanding that the company is de-listed from the London Stock Exchange. They expressed solidarity with indigenous farmers in the Niyamgiri hills who are fighting the infamous global diversified metal and mining company, called Vedanta. A loud group of protesters from Foil Vedanta and other grassroots groups blocked the entrance of the company’s Mayfair headquarters, holding a banner reading ‘FCA: de-list Vedanta’. Friday was the day when people in Niyamgiri were expecting to hear the final verdict on Vedanta’s planned mega-mine in Odisha. But the Supreme Court in India has deferred its final verdict until 21st January. If permission to mine is denied, Vedanta is likely to close its Lanjigarh refinery due to lack of bauxite costing them billions. 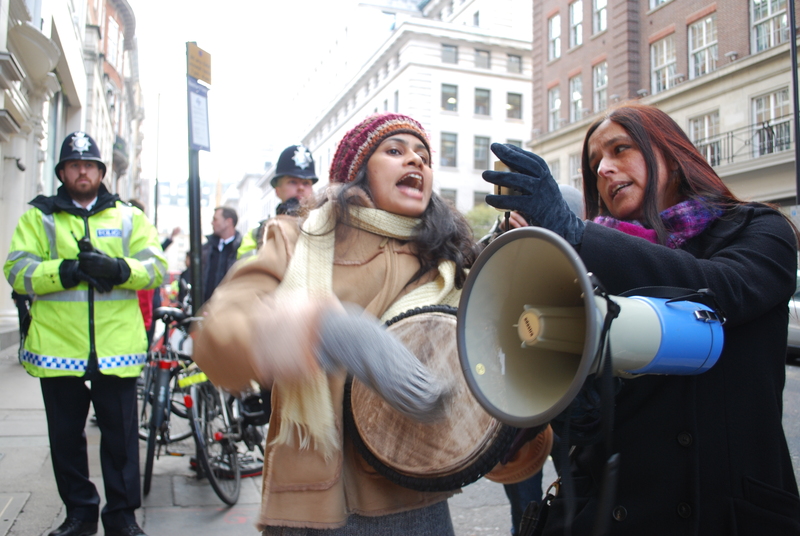 Rumana Hashem plays Indian samba at the noise demo at Vedanta’s High Quarter in London. Protesters from a number of environmental and human rights organisations and grassroots groups including Foil Vedanta, Phulbari Solidarity Group, Tamil Solidarity, Action Village India, Japan Against Nuclear, London Mining Network, National Committee to Protect Oil, Gas, Mineral Resources and Power-Port in Bangladesh, Climate Justice Collective, World Development Movement, and Survival International have gathered at Vedanta’s London headquarters from 1pm sharp and shouted against Vedanta’s crimes for two hours. 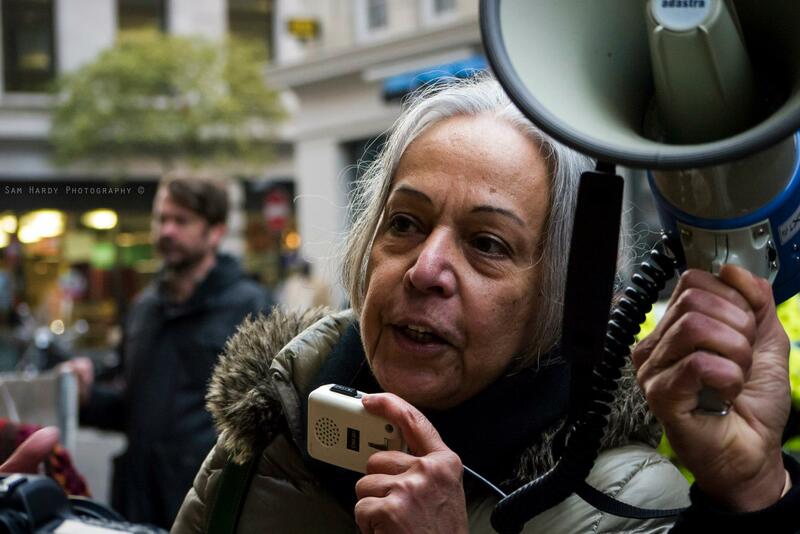 The demonstrators called for the Financial Conduct Authority to remove Vedanta from the London Stock Exchange for its poor corporate governance, unethical operations and human rights violations. A colourful and loud group of protesters chanted slogan ‘Shameless Vedanta – out of London’, ‘Anil Agarwal – blood on your hands’. Some angry protesters blew horns and whistles, whilst others played drums and made terrible noise with various pots outside Vedanta HQ which was loud enough to disrupt Vedanta’s work environment. 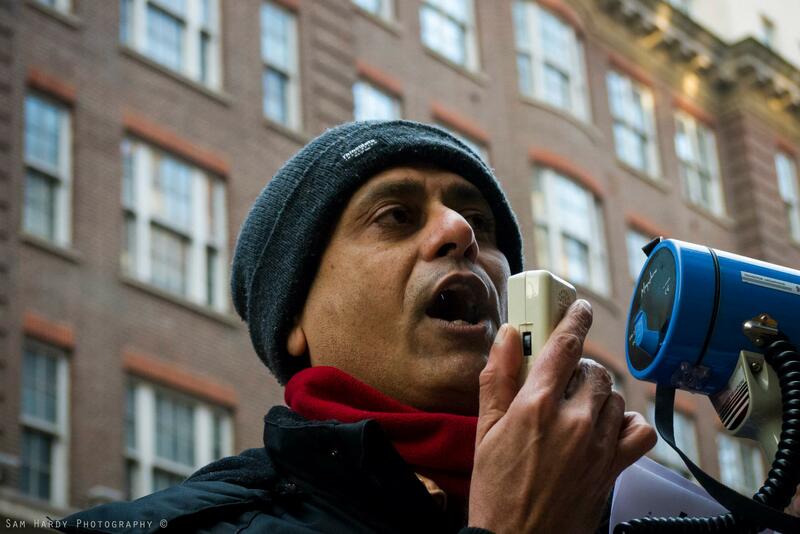 Vedanta’s infamous activities have been criticised by many in London. Several parliamentarians and the former CBI Director Richard Lambert have highlighted how Vedanta’s listing is used for legal immunity to hide their corporate crimes. If Vedanta loses the case to allow state owned company Odisha Mining Corporation to mine the mountain on their behalf they may have to close the dependent Lanjigarh refinery costing them billions. ‘We will continue our fight even if permission to mine Niyamgiri is granted to Vedanta. Are these Judges above the Law? They act as if they are though Niyamgiri belongs to us. We are fighting because we are part of it’. Rumana Hashem of Phulbari Solidarity Group and National Committee of Bangladesh says, ‘We, the people from Bangladesh National Committee and Phulbari Solidarity Group, extend full solidarity with the people in Niyamgiri and with all of you who are protesting against Vedanta and Anil Agarwal’s unethical activities abroad. We believe that the Supreme Court verdict will reflect Niyamgiri peoples’ verdict’. ‘It is a juncture when we should put hands together and connect our struggles’, she added. At the Supreme Court in Delhi, lawyers for Vedanta dwelled on the ongoing demonstrations in London. They questioned the reasons for why people are protesting in London, claiming that India is troubled by London demo. However, Judges noted that this discussion is not relevant to the case and pointed out that people have a right to protest in a democratic country. This entry was posted in Vedanta and tagged Niyamgiri, Phulbari Solidarity Group, Vedanta. Bookmark the permalink.